The Fordham Professional MBA at the Gabelli School of Business follows a fall, spring, and summer trimester schedule and can be done part-time or full-time. Both day and evening classes are offered Monday through Thursday. Saturday and online courses are also offered in the fall and spring trimesters. Trimesters begin in September, January, and April. Part-time students can take courses at both Fordham’s Lincoln Center campus as well as its Westchester Campus, where courses are offered on Monday and Wednesday evenings. Students may move freely between the two campuses while pursuing their degrees, or fulfill all of their degree requirements on one campus. However, students completing all of their MBA requirements at the Westchester campus have a narrower selection of possible concentrations. While part-time students may elect to take up to nine credits in a given trimester, they must be enrolled in at least six to be eligible for student loans through the Fordham Gabelli School of Business. Students may switch from part-time to full-time status if necessary, and vice versa. If studying full-time, students can take 4-5 courses per term, while if they are also working students can take one-two courses. Fordham Professional MBA students typically complete 69 credits to graduate. However, students with previous relevant coursework may waive nine credits of prerequisite courses in Mathematical Methods for Business, Statistics and Managerial Economics. Additionally, students may choose to waive any of the program’s nine core courses, which together make up 24 credits. Students waiving courses must still meet the minimum residency requirement of 45 credits. All MBA students must complete a concentration in at least one of seven disciplines: Accounting, Public Accountancy, Communication and Media Management, Finance, Information Systems, Management Systems or Marketing. Students complete five courses representing 15 credits of coursework in their concentration, as well as at least 15 credits in electives outside of their concentration. Students fulfilling all of their degree requirements at the school’s Westchester campus have only three concentrations options: Finance, Management Systems, and Marketing. Students may gain additional specialization in a core business area by pursuing one of five secondary concentrations in Entrepreneurship and Venture Initiation, Electronic Business, Global Sustainability, Healthcare Management or International Business. In addition to meeting the distribution requirements set forth above, students seeking to fulfill a designation must take at least 15 credits of designated courses, which comprise both core and elective courses. Students enter the class profile with between 5-7 years of professional work experience and are between 28-to-30 years old. The most recent class featured 31 students. The average GMAT of the class is 556 and the respective GPA is 3.28. Fordham’s Office of Career Management provides a full range of services to part-time MBA students, including career workshops and one-on-one career counseling focused on cover letter-writing, resume review and interview preparation. The office also sponsors numerous corporate speakers and networking events. The Professional MBA students have access to the same career resources as the Full-time Cohort MBA students. Tuition for the Fordham Professional MBA program is $1,495 per credit. Students should also factor housing costs into their financial considerations. 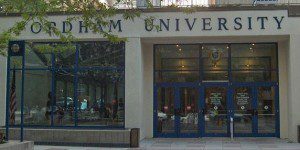 Fordham does offer university housing for graduate students. Professional MBA students are eligible for a number of need- and merit-based scholarships, although they are not eligible to pursue graduate assistantships. Scholarships include the Hitachi Minority Scholarship for minority students; the Emily L. and Robert E. Smith Scholarship for female students pursuing international studies; and the Linda Perrin Taber Pollack and Roy Howard Pollack Scholarship for second-year students demonstrating academic merit and financial need. Fordham graduate students are eligible for both Federal Direct Unsubsidized Loans and Federal Direct Graduate PLUS Loans. Students are also eligible for an array of private loans, which typically require a creditworthy U.S. co-signer. In addition, Fordham’s Office of Admissions offers the Fordham GBA Loan to students who need to supplement other government or private loans. These $5,000 loans are awarded based on merit and need and are available for domestic students enrolled in at least six credits at the time of their loan application. Students may only be awarded one GBA Loan over the course of their studies at Fordham. Ten of these loans are available to students for the current spring 2015 trimester. Fordham requires that applicants have a minimum of two years of work experience to gain admission to the MBA programs. There are no minimum GPA or standardized test score requirements for admission. Applicants to Fordham’s full-time MBA program are required to submit an online application, undergraduate and (if applicable) graduate transcripts, official GMAT or GRE scores, two professional letters of recommendation, a professional resume, two essays about their professional goals and aspirations and a $130 application fee. International applicants submitting undergraduate or graduate transcripts must also submit a third-party evaluation of the transcripts. International applicants must also submit TOEFL or IELTS exam scores—minimum scores of 600 on the TOEFL or 7 on the IELTS are required. If international students score below these cutoffs, they may be required to take the English as a Second Language (ESL) proficiency exam. Interviews are typically not required to apply and are scheduled at the request of the applicant. However, in certain cases the Fordham Graduate School of Business admissions committee will request that applicants attend a mandatory admissions interview.